No Retrofit will work here. If your house does not have significant tilting of the floor where you can see obvious movement of the foundation from its original location, then the foundation is holding up the house just fine. Even then, this movement probably took decades to occur. If the floor IS level then the foundation is supporting the house off the ground exactly as it is supposed to and nothing needs to be done. The second function of a foundation is to absorb earthquake forces and transfer them into the ground. If segments of the foundation are in bad shape or completely missing is immaterial so long as there is enough good foundation to attached the house to. It is very rare for a foundation to be in bad enough shape to warrant replacement and rarely does it make sense to replace a segment of deteriorated foundation so long as the rest of the foundation is in good shape. The California Existing Building Code specifies that old concrete can be assumed to be 1500 psi concrete which is exactly what the structural engineers tested. Therefore, unless tests show otherwise, we can assume that the existing concrete will perform quite well in a retrofitted house. Please scroll down until you see section Table A4-A and look at item number 3.1. When a house has severe foundation cracks and settling, floors can become uneven, cracks appear in stucco and plaster walls, doors often stick in different seasons, existing cracks in the plaster or sheet rock walls seem to get larger and smaller and, once repaired, simply return a few months later. 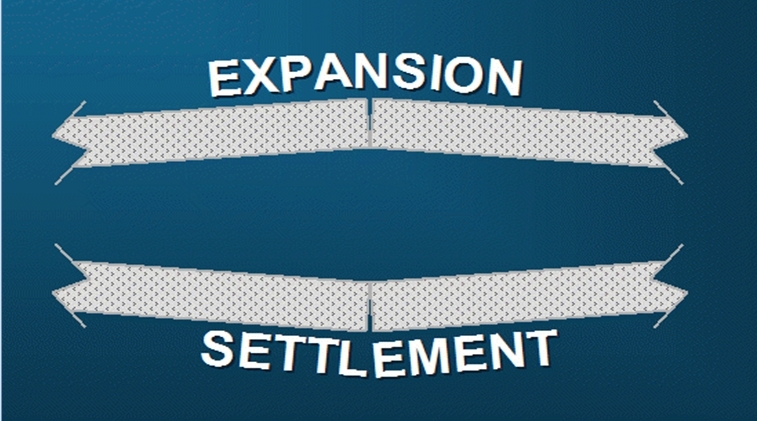 This expansion and contraction can also cause cracks in plaster and around windows and doors. 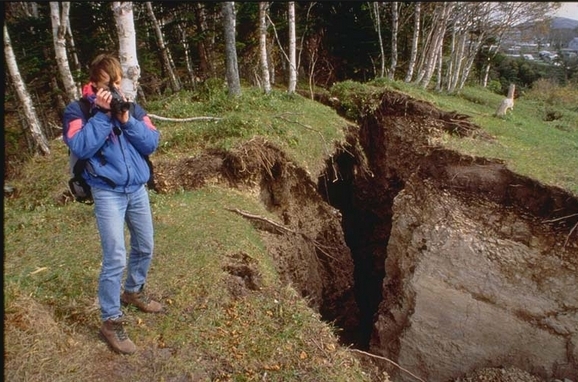 In this article you can read more here about expansive soils Historic building preservation structural engineer Nels Roselung wrote an excellent article on settling and foundation cracks that will answer many of your questions. Hold both ends of a pencil and snap it in two in an upward direction. This is similar to the upward expansion of soil under a foundation that causes it to crack. Snap it in a downward direction. That is equivalent to downward pressure caused by the weight of the house on the foundation and is called foundation settlement. Foundation cracks are a normal part of settling and unless the crack is rapidly expanding there is nothing to worry about. Foundation cracks are irrelevant from a retrofit point of view. Earthquake forces put the foundation concrete in compression (pushing on the sides, not up and down). Concrete can resist a tremendous amount of force when put in compression do very well. Imagine pushing a pencil on both ends towards the center. This is called compression. No matter how hard you push, the pencil will not break. If you see a half inch crack, it means the foundation heaved upward or sunk downward because of the expansive soil. Expansive soil is the rule rather than the exception in the Bay Area such that cracks in foundations are quite common. Cracks like this are not a cause for concern. If the foundation is holding the house up, it is doIng exactly what it is supposed to do and need not be “fixed.” If the crack is irrelevant in terms of retrofitting the house, then the foundation will serve in that function as well. In short, if a foundation with a crack will and can perform as exactly intended by the building code, why repair something that is not broken. Some foundations in the San Francisco Bay Area have minimal amounts of mortar, used contaminated water from the bay, are made of brick, or have other very serious structural issues that need to be addressed before a retrofit is performed. In these cases the foundation must either be replaced or supplemented with segments of good foundation. Fortunately, foundations with serious structural problems are very rare and it can be presumed that your foundation is just fine if the house is attached to it with a retrofit. Previous earthquakes and laboratory tests have proven this over and over. All retrofit building codes don’t even address working on the foundation because it is assumed they will not be a failure pont. Foundation settling and cracks are completely normal. Most of the Bay Area, especially in the flat lands, has soil with a great deal of clay in it. Clay soil expands when it is wet and shrinks or settles when it is dry. This expansion pushes up on the foundation causing the house to move upward slightly while dry soil causes the foundation to settle. The weight of the house itself is not always evenly distributed along the foundation such that a heavier portion, or a portion under softer soil, will sink. The heaving and sinking causes foundation cracks and over time the house settles into the clay. If the settling on one side of the house is more than on another you will see uneven floors. Settling can also cause cracks in the walls and ceilings, especially in the corner of door ways and windows. Sinking of only one inch can put considerable strain on brittle plaster, causing it to crack, and put doors out of plumb enough to cause them to stick. There is no viable solution to this besides jacking up the floor on the sunken side and increasing the height of the foundation until the floors are even. This is an expensive enterprise and does not really address the problem clay soil. Another solution is to use bench piers which are discussed in the video above. From an earthquake resistance and retrofit point of view it makes no difference at all. Rotation is caused when the outer side of the foundation is saturated with moisture while the soil in the crawl space is dry. When the house was built, its weight pressed evenly on the inside and outside of the foundation. When the soil on the outside becomes soft and saturated the foundation starts to sink on the outside edge. This causes the outside edge of the foundation sink into the ground and the inside edge pull up. This has ZERO impact on a foundation’s ability to hold a house up off the ground or its ability to perform in an earthquake. 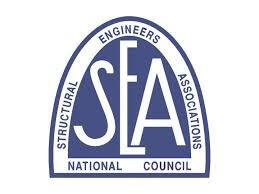 The purpose of putting steel reinforcement into a foundation is to add tensile strength to the concrete. Steel has tremendous tensile strength. Concrete is the other way around, it has tremendous compression strength (after all, it is basically composed of rock), but its tensile strength is weak. 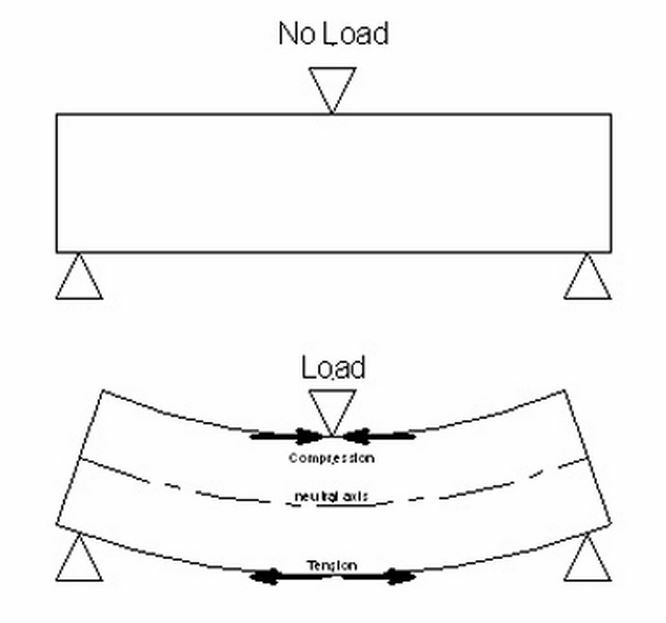 In the image below “load” means weight of the house on the foundation. 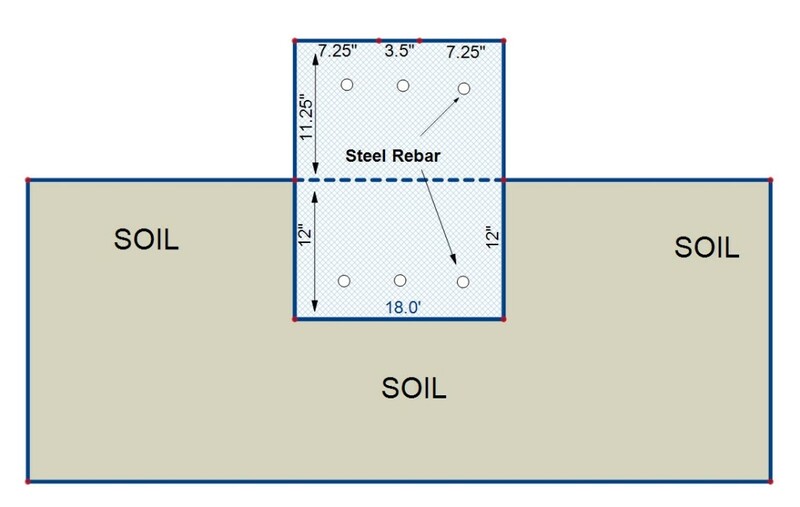 If steel in placed in the foundation to prevent the concrete from bending, in other words it resists tension, the concrete should not settle or crack. 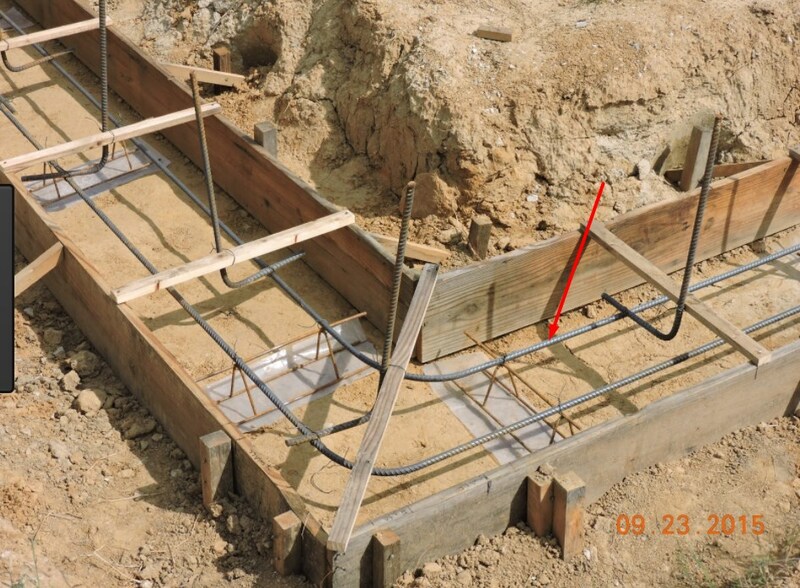 Long rods of steel are placed in the foundation ditch as shown by the red arrow before being filled with concrete and has been a building code requirement since July of 1997 and gives concrete compression strength. Compression strength is important when the force of gravity or the heaving of expansive soil places pressure on the foundation. 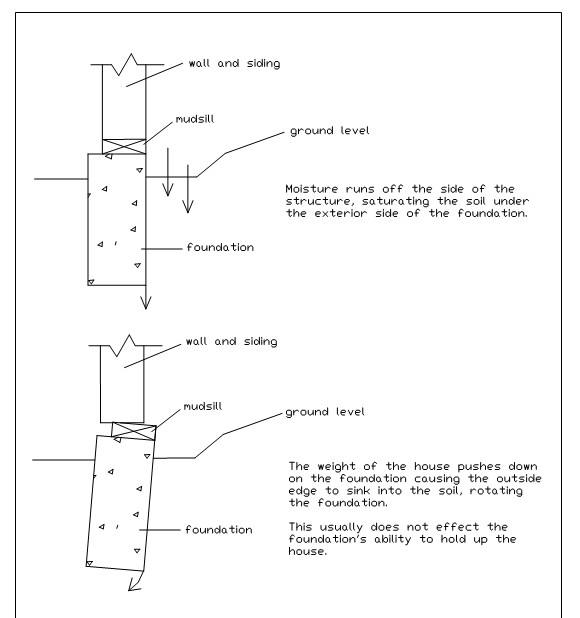 Foundation bolts put the concrete in tension which is an inherent strength of concrete. In other words, not having rebar in a foundation from a retrofit point of view is not a big deal. R403.1.3 Seismic reinforcing. Bottom reinforcement shall be located a minimum of 3 inches (76 mm) clear from the bottom of the footing. A Retrofit Foundation-the concrete above ground is for more mass. Here we are looking at it from the end. The minimum depth of footings below the undisturbed ground surface shall be 12 inches (305 mm). The minimum width of footings shall be 12 inches. Here you will find the complete code citation. In order to figure out how much concrete you will need, you multiply the length of your ditch by the width and the depth using this conversion tool. R403.1.3.1 Foundations with stemwalls. Foundations with stem walls shall have installed a minimum of one No. 4 bar within 12 inches (305 mm) of the top of the wall and one No. 4 bar located 3 inches (76 mm) to 4 inches (102 mm) from the bottom of the footing. R319.1 Location required. Protection from decay shall be provided in the following locations by the use of naturally durable wood or wood that is preservative treated. All wood framing members that rest on concrete or masonry exterior foundation walls and are less than 8 inches (203 mm) from the exposed ground. Wood siding, sheathing and wall framing on the exterior of a building having a clearance of less than 6 inches (152 mm) from the ground. R319.1.1 Field treatment. Field-cut ends, notches and drilled holes of preservative-treated wood shall be treated in the field in accordance with AWPA M4. R319.1.4 Wood columns. Wood columns shall be approved wood of natural decay resistance or approved pressure-preservative-treated wood. R319.3 Fasteners. Fasteners for pressure-preservative and fire-retardant-treated wood shall be of hot-dipped zinc-coated galvanized steel, stainless steel, silicon bronze or copper. One-half-inch (12.7 mm) diameter or larger steel bolts. Fasteners other than nails and timber rivets shall be permitted to be of mechanically deposited zinc- coated steel with coating weights in accordance with ASTM B 695, Class 55, minimum.